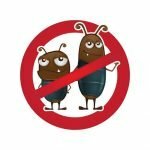 What Should the Average Homeowner Know about Wasp Pest Control? If you notice a bulbous, papery nest that’s gray in color, you may have found a wasp nest, which means you need wasp pest control. 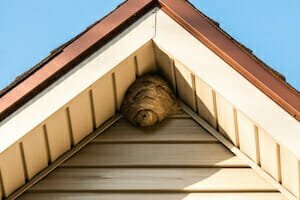 But before you take matters into your own hands or hire an exterminator, it’s good to have a better understanding of how to get rid of wasps and how to prevent them from setting up a home next to yours. This last point is very important, because wasps aren’t necessarily bad creatures and Mother Nature needs them. There are two positive things that wasps do in nature. First, they help pollinate plants. They don’t get all the attention and press like bees do, but they’re an important part of helping plants reproduce and survive. 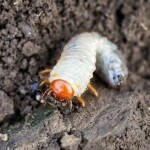 Second, they feed on many other insects that many humans, especially farmers, consider pests, such as weevils, grasshoppers and caterpillars. Given these benefits, it doesn’t mean you must leave wasps alone, especially if they’re by your home. But it emphasizes that preventions are the ideal form of wasp control. Once a group of wasps set up their nest somewhere, they protect it vigorously. When this nest is in some uninhabited area of the woods, that’s great. But when this nest is in the top corner of your porch, you have a major problem. Many wasps are social creatures and stay in groups, especially close to nests. But some wasps live and travel alone. For these solitary wasps, the removal option will be different than a large social group of wasps in a nest. For instance, you can often avoid using harsh chemicals when dealing with solitary wasps by simply setting up baited traps. These traps will attract the wasps and prevent their escape. Then you can dispose of the wasps easily. Wasps love to set up a nest in hidden locations, such as within walls. When this occurs, you have to use special removal methods. For example, you can’t kill the wasps while they’re inside your walls. Otherwise, you’ll have to deal with dead and rotting wasp carcasses behind your drywall. Unlike bees, a wasp’s stinger will not come off after the first sting. This is all the more reason to be careful when encountering wasps and get rid of them if they threaten your home. Like most other insect pests you deal with around the home, wasps love human food. So one way to avoid wasps in the first place, or avoid their return after their elimination, is to keep food that might attract them in sealed containers or to dispose of it quickly. Effective wasp pest control takes these factors and facts about wasps into account and utilizes special strategies to prevent infestation as well as eliminate any wasps that manage to grab a foothold close to your home. For additional information about dealing with wasps, contact Think Green Pest Control at (844) 648-2556 to discuss your wasp pest control options.